Something is wrong if there are more and more students who are not interested in school, students who have lost their motivation and more and more misbehavior in classrooms. The actual way of learning highlights the contents of the course and the volume of new things to be learned and is very much attached to the school building and the desk. This is not how it should be today. The solution is a school that takes into consideration the life around it and wants to reinforce the student's experience of meaningfulness. Teachers today have to be able to share their expertise in order to turn their students into active players. The contents of the school form a part of life and they should not be alienated from it. 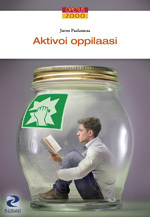 Jarno Paalasmaa tells in his novelty book how by making even a little enlargement to the learning environment you can turn the learning process into something activating and inspiring. The book presents in diverse aspects the tools that prevent the school institution from drifting into a meaningless place to the kids and youngsters. Also the greatest concept of schooling and education, the liberty, is being scanned from various angles.